3. Click on the "Site Preferences" button on the Site Preferences Menu screen. a. Attribution - This preference determines the format used when a user posts on your website. b. 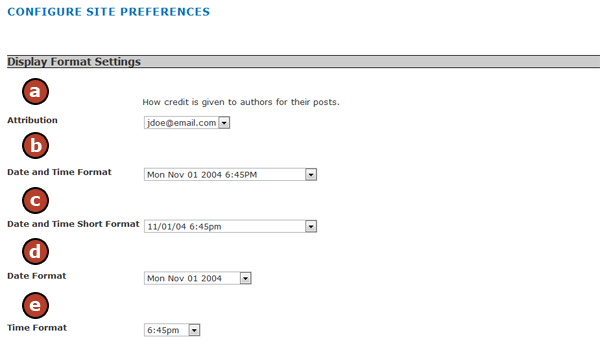 Date and Time Format - This preference determines the format used when the date and time appears on the website. c. Date and Time Short Format - This preference determines the format used when the date and time appears on the website. d. Date Format - This preference determines the format used when the date only appears on the website. e. Time Format - This preference determines the format used when the time only on the website. a. Default Visitor Language - This preference drop down lets allows selection of the default language the website appears in when the website is visited. b. Enable Switching - Checking this preference will allow the website to have multiple language navigation menus and an option of language choice for visitors on the navigation menu bar. The choices will appear as a drop down menu of flags with languages listed next to the flag. c. Configuration Language - This preference drop down menu allows a language to be selected on edit screens. a. Google Analytics - HotDoodle allows integration with Google Analytics, a free web based website tracking program. An account with Google Analytics is required for this integration to function. This field is used to enter the Google Analytics account number. For full integration, the Google Verification field must be filled out as well. b. Google Verification - This field is where the Google Verification string provided by Google Analytics is entered to fully integrate Google Analytics website tracking. 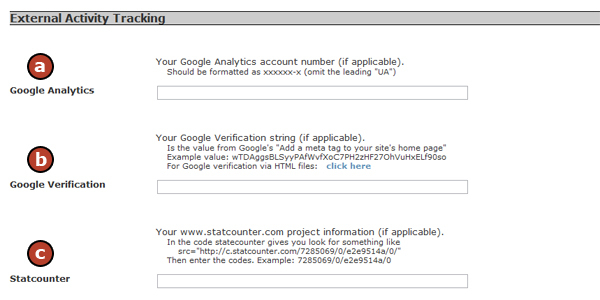 For full integration, the Google Analytics field above must be filled out as well. c. Statcounter - HotDoodle allows integration with Statcounter.com a free web based website tracking program. An account with Statcounter.cam is required for this integration to function. This field is where the code from Statcounter is entered to track the website activity. a. Session Timeout - This preference allows the selecting of the number of minutes a user can be idle on the website before they are automatically logged out. b. 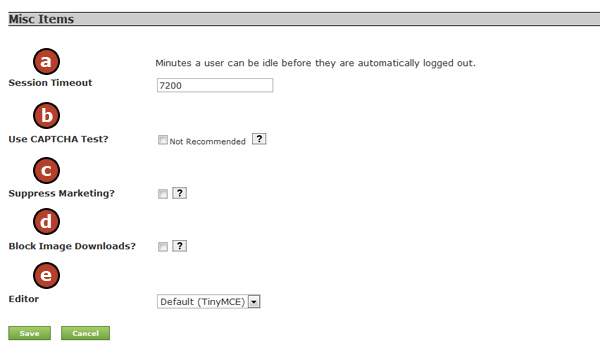 Use CAPTCHA - This preference requires registration on the website to display a CAPTCHA test. A CAPTCHA (Computer Automated Public Turing Test to Tell Computers and Humans Apart) is a means to prevent massive account registration on a website. When registering a new user account, the visitor will be required to enter a series of letters and numbers appearing in an image. This test prevents automated computer bots from registering a large number of fake accounts. HotDoodle websites have built-in robot detectors that, in almost all cases, make CAPTCHA tests unnecessary. c. Supress Marketing? 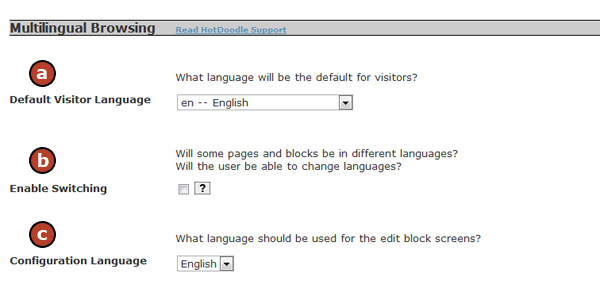 - This preference when clicked, suppresses the display of the "Created with HotDoodle" icon at the bottom of the website. The supression of the HotDoodle name on a website costs extra. d. Block Image Downloads? - If this preference is checked, visitors will be unable to right click on images on the website to save them. e. Editor - This preference allows selection of the editor mode for the website.